The nameplate not only represents the name of the family but also it conveys the status of the family in the society. While creating it, the artist considers the area and the background of the nameplate where it is going to be placed. And accordingly he creates the particular form and the style of the calligraphy to enhance the beauty of the house. From an artistic viewpoint, it is interesting to see how this layout has conformed some part of the surface it was written on, or how the other interesting design elements like peacock forms have been creatively drawn around the calligraphy of the name. Some of these nameplates are placed in an available area as a shop name or name of the house. Casa in Portuguese means house. Sometimes these nameplates are crafted in ceramic, terracotta and fibre resin. It also depends on the location and owner’s choice. In these nameplates normally decorative elements of wavy creepers and creative floral forms are been used. 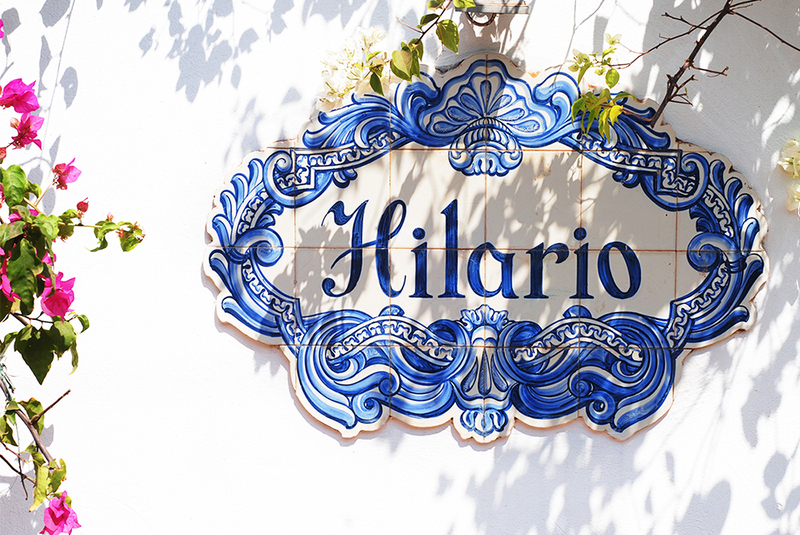 The Portuguese improvised on the colour blue and spread this art throughout the world today known as ‘Azulejos’. 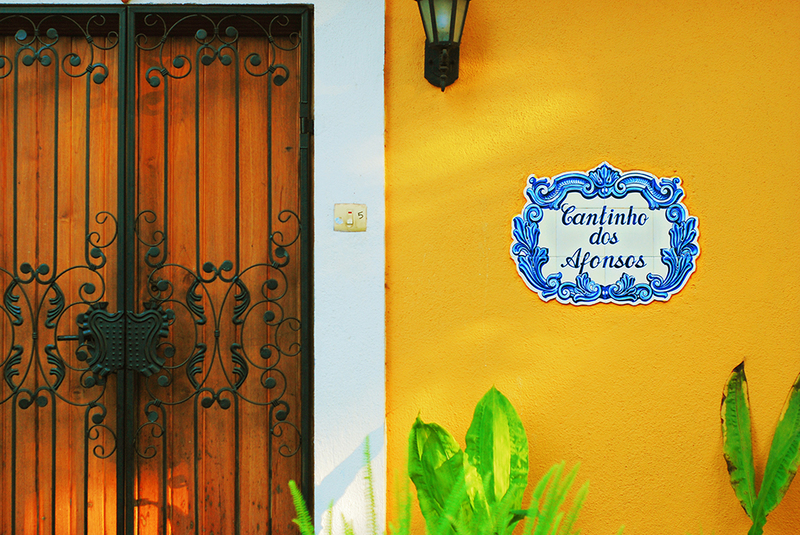 Azulejos are decorative palm-sized ceramic tiles that are widely comprehended as a unique feature of Portuguese architecture. 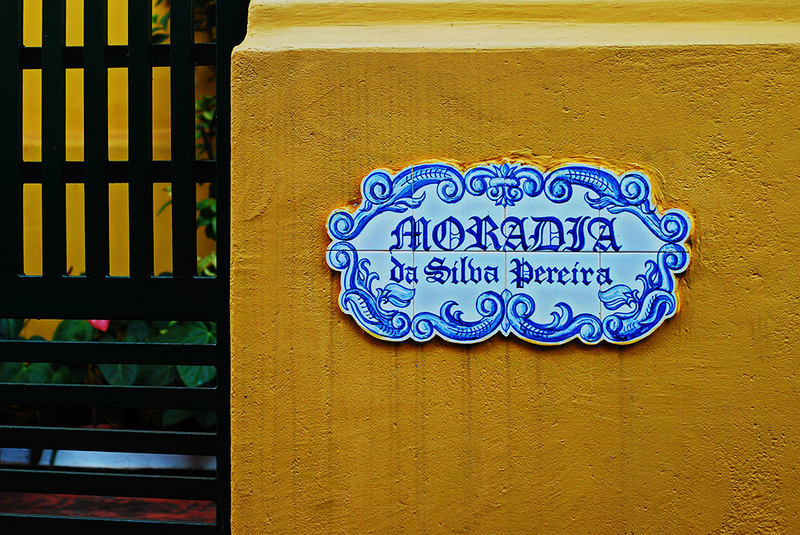 Most of the chapels, Goan houses, even hotels today have these kinds of nameplates and signage made of Azulejos. These nameplates are placed outside of the houses on the available area though it’s a door wall or a pillar of the fence. The ceramics for these nameplates are made out of five different types of clay, shaped and poured into a plaster-of-Paris mould and baked. It is then painted with specially mixed lead-free paints imported from Europe, glazed and baked again in a furnace. Lead-free paints imported from Europe are used in every artefact made in ceramics, which increase the durability of such artefacts. These nameplates are hand-painted tiles using the traditional and the modern as two distinct techniques. This can be found in various in sizes placed outside the houses in Goa. The decorative elements are painted in basic vibrant colours but generally the names are in shades of blue to maintain the traditional look and feel. 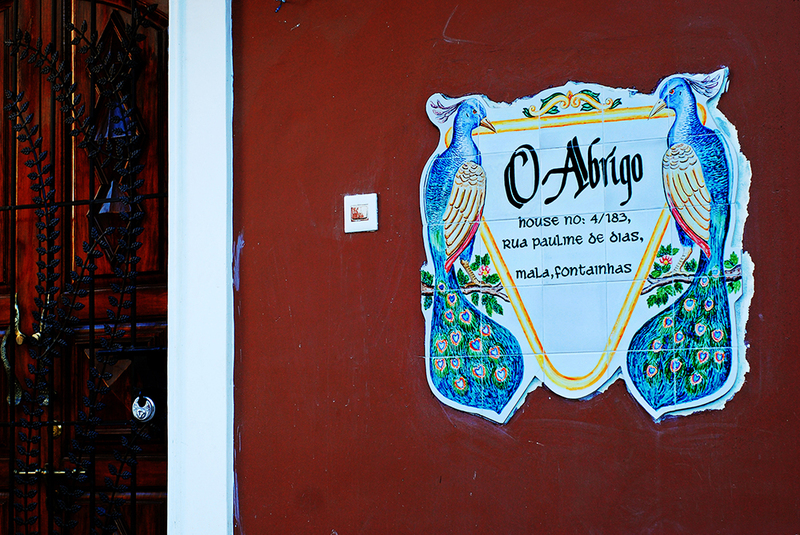 The nameplate at an abandoned old Indo-Portuguese house imbibed in the pillars of the entrance weathered but still gaining readability over time due to the settled dust within its crevices. These hand-painted tiles are made in the traditional and the modern as two distinct techniques. Classically, it is a square plaque of ceramic material cut at the edges according to the decorative elements around it, one side of which is decorated and glazed. 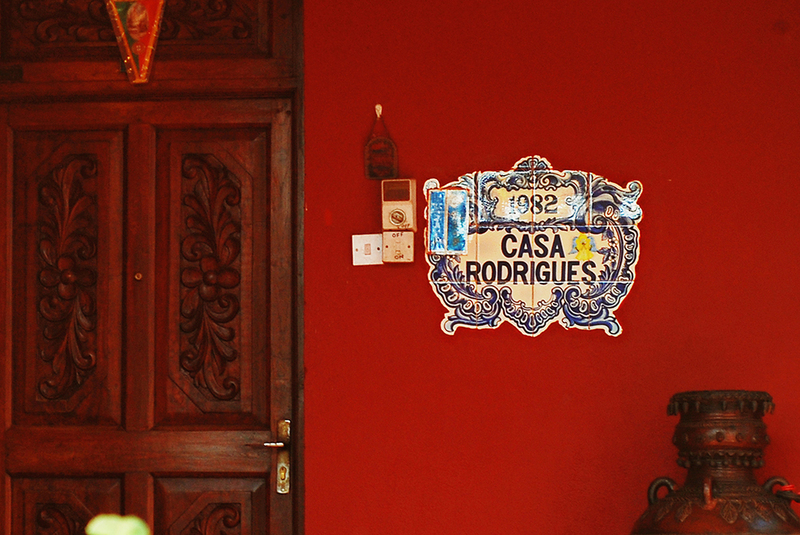 The Azulejos are a typical form of Portuguese painted, tin-glazed, ceramic tile work. 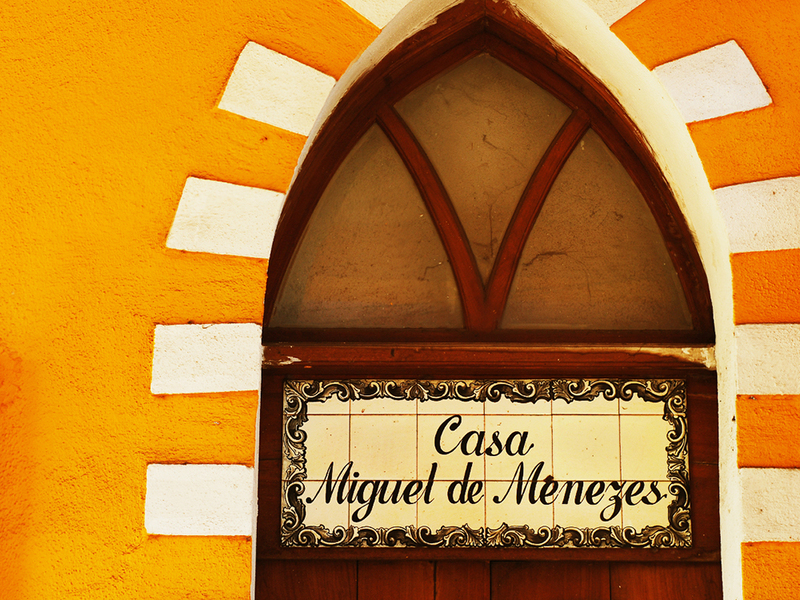 The Azulejos are seen as coverings of large areas inside and outside buildings, sometimes as signage and sometimes the nameplates for the shops or a house. 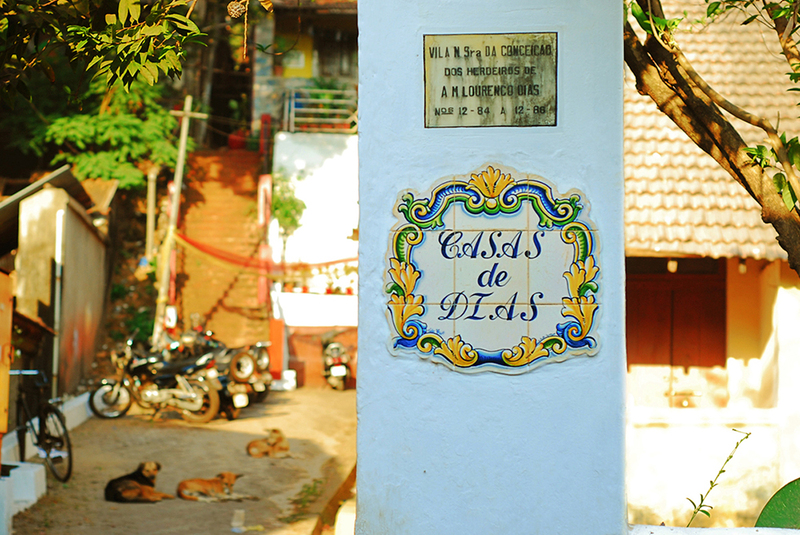 Some of the nameplates made in ceramic tiles have remained ingrained in the local scenario long enough to be considered regional heritage of Goa. 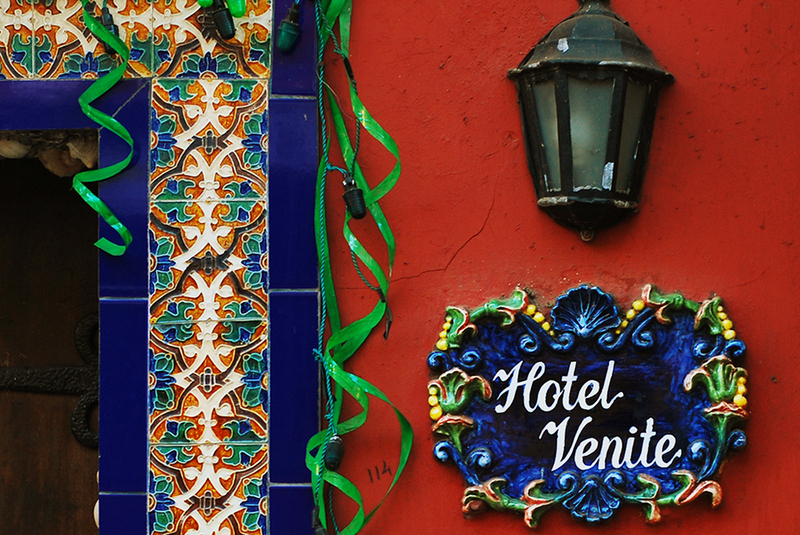 Azulejos are used not only for nameplates but also to create murals on walls and ceilings to enhance the beauty of the place. These visuals of nameplate don’t remain only impressive beauty of the place but become carriers of the marvellous coulter of Goa. Goa is one of the most attractive destinations for the tourist from all around the world, it is not only because of the beautiful beaches but the culture and the architecture. While wandering through the cities and villages of Goa, you will come across the beauty in the architectural designs of the houses and the churches, the decorated premises, the pretty roof, the rooster ornament on top, decorative windows and doors, house entrance and also the nameplates. Some of these houses are recognized by their attractive nameplates and some by its architecture. It is also prestigious in the society to have nicely painted, bold and attractive nameplate at the entrance of the house in Goa. Most of the nameplates are done in ceramic. Some are hand painted and some are machine made. These beautifully painted nameplates can be seen at the Indo-Portuguese house entrance, on the door, at the gate and also as signages of shops and corporate offices in Goa. 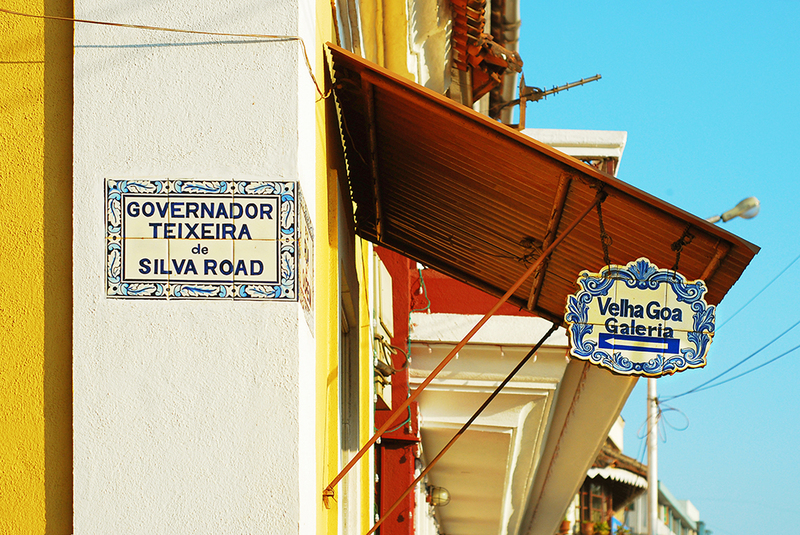 Most of the nameplates are written in Portuguese language and painted with decorative elements around it on the ceramic tiles. These artistically created nameplates are normally painted on the white background of ceramic tile with the shades of blue. These tiles were first made by the early Chinese and later by the Moors who improved on this art form. This art then spread out to Holland, Spain, Germany and Portugal etc. somewhere in the 16th century. 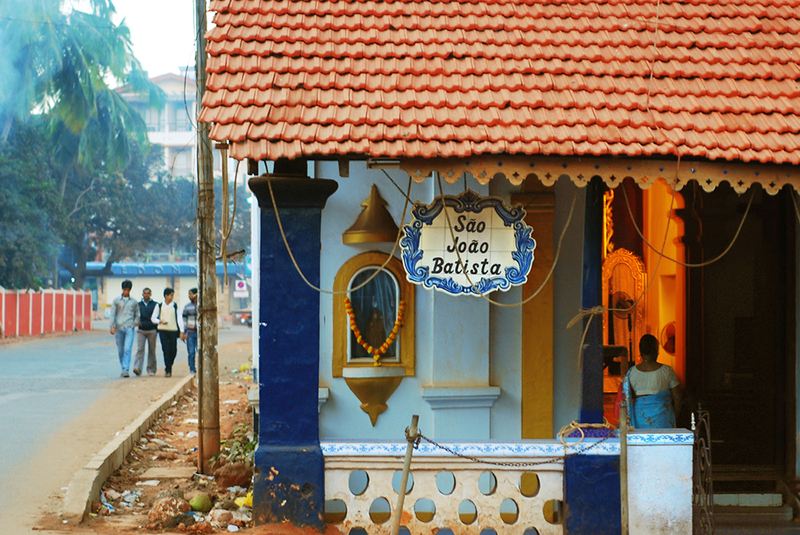 The Portuguese improvised on the colour blue and introduced this art form into Goa. 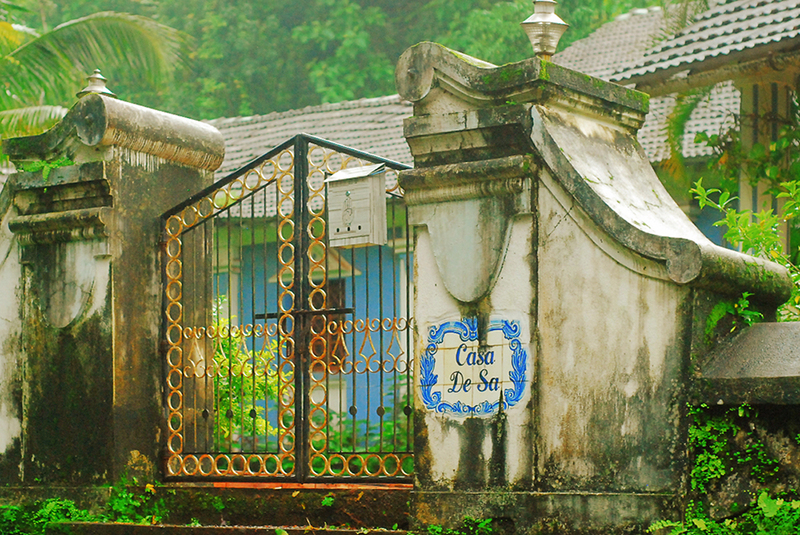 These calligraphic nameplates convince the given name to the house or a villa in Goa. The relation between the words and status of the people in the house or a commercial place can be seen when you notice the way it’s written on the nameplates. One can enjoy the artistic placing of these nameplates, some of them are in hanging position some are embedded in the entrance wall. These nameplates are made from durable weather-proof ceramic with a gloss finish. They are surprisingly strong and very solid. Hand Painted Ceramic nameplates and door numbers moulded and fired the traditional way. 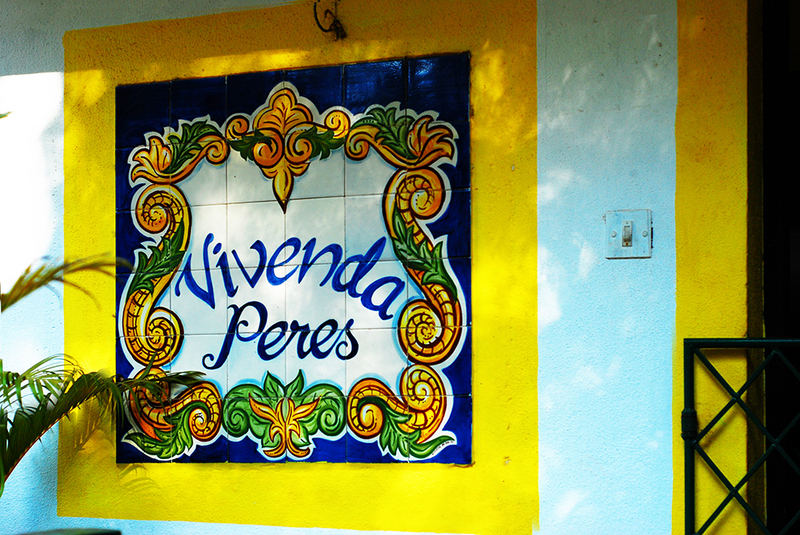 There are few artists and institutions are left in Goa who create these hand painted nameplates on ceramic tile. The culture of having such wonderful tiles as a nameplate has spread all over the world now, as it interests many.